There are many ways your best client can help you win more business. Our last blog talked about using them to develop an avatar and the key messages that form the core of your marketing communications. Let’s look at just how many different ways your best client can help. We covered this in the last article, but it makes absolute sense that you want more clients just like your best one(s). Why wouldn’t you. Again we’re nicking the kudos of the last blog, but it’s still valid. Let’s get the obvious ones out of the way first shall we! Whether they give you referrals because you ask them to, or completely off their own back, you want them to give you referrals. It shows they trust you and believe in you. The words they provide are hugely powerful. We all buy online and we’re influenced by the reviews provided by others who have bought that product. As your best client has been using your services for some time, they will be respected by their peers and will support your sales efforts. Potentially even more powerful, assuming you include the results you deliver rather than just what you did. People who read the case study will be looking to understand what your best clients gets in return for using your services. They’re not as interested in what you did and what happened. For a complete guide on what makes the best case studies, click here. Do you ever offer a prospective client the opportunity to talk to your clients? In the same way you look for references when employing a member of staff, prospects often look for the same. Of course, testimonials and case studies can provide an alternative, but some still want to talk to a real human being. Who better to give them to talk to? If you’re thinking of adding services or changing something, running past your best client is a good idea. Depending on why you are making changes, getting their opinion on whether the changes are positive, or not, is really useful feedback. If, as your best client, they wouldn’t buy the changed product or service, should you be trying to make the changes? Of course, a sample of one is never a good idea, but it’s definitely a starting point. There are other ways your best client can help you. It doesn’t just have to be about winning new business. We’re not suggesting you steal their staff – that’s not a good idea. However they may know people who can fill your vacancies. Keep them up to date with the people you are looking for. You never know. 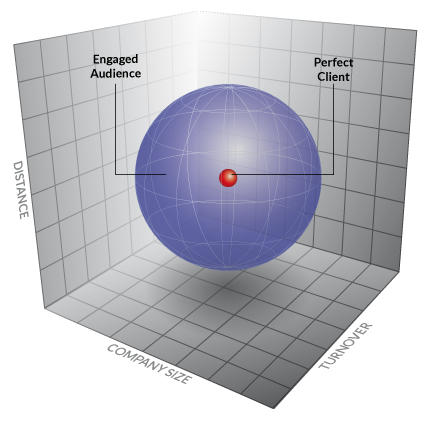 If your business is a similar size or has similar needs to your best client, why not ask them who they use? Perhaps your office cleaners aren’t very good or you’re looking for new office furniture. Who did they use and would they recommend them? By asking them, you’re showing you respect their opinion and you trust them too. As a director of a small business, you want to sell to as many people as possible. By doing that, you grow the business and you, hopefully, increase your profits. So why am I suggesting you think about just one person: your best client? Who’s the One Person you know most about? Who is the person you know most about? Your Best Friend. Who is your best friend? How well can you describe him or her? I would hope that, considering they are your best friend, you can describe them in detail. What they look like, their preferences, their job, where they live, their political affiliations and much more. Talking to your best friend is easy isn’t it. You talk about the hobbies you share. Other friends you share are prime targets to talk about (you know you do, even if you won’t admit it). You share your opinions of what is happening in the news – and you know what their reply is likely to be. It’s simply because you know them in detail. There are 100s of members at your gym, your golf club or the pub. You’ve probably met a lot of them and so can recognise them, at least facially if not by name. But do you know as much about each of them as you do about your best friend? It’s the same when thinking about your strategic marketing planning. Who is your best client? Be careful when you think about your best client. They may, or may not, be the company that spends the most money with you. Without doubt, they should be the company that generates profit. They are, most likely, a company you’ve been working with for some time and you want to work with for a long time to come. What would your business be like if you had a lot more clients like this one? Thinking about everyone is far harder than thinking about one specific company and one person in that company. Your best friend has that privileged position because you have a lot in common. The chances are, your friends are the same: you have a lot in common. They all want to improve their fitness levels. Many of them will be looking to lose weight and/or get that beach body, in readiness for the summer. You know that they have some disposable income – gym fees are rarely low. They will be in an industry sector you know and understand. Their office is likely to be relatively close to yours and they will spend sufficient money with you so that they are interesting and profitable. What’s the decision maker’s job title? Is that the same, or similar, to decision makers in other clients. • Architects in London, with the Senior Partner as the decision maker. LinkedIn lists 50 people with that description. Already your target audience has grown from one person to 50. If you tweaked your description to say the whole of the UK , the number increase to 123. Some Senior Partners will call themselves the Founder. Your audience has now increased, purely on LinkedIn, to 3,518. You can see descriptions of our Ideal Client here, if you would like some guidance on how to describe them. How many of your other clients are like this client? Let’s leave the personal analogy aside from now on. But think about the issues your Ideal Client has. The issues they have will be the same, or very similar to issues experienced by other companies of the same attributes. What do you help them with? How often do you help them? How do you help them? Everything you list here is highly likely to be relevant to the 3,518 Senior Partners or Founders we identified earlier. By simply thinking about your best client, you’re now identified the issues and the ways you can help 1,000s of potential clients. Your best client is one that will be very happy with the work you’ve done for them. The question we’re asking you is: What does a successful piece of work look like? When you then talk to your target audience about the successes you achieve, they will like what they hear. They will recognise how you talk about the type of client you work with and the issues you help them resolve. Recognition is easy because they are similar companies, with similar issues. They will listen to how you will resolve the issues, but that isn’t the important bit. What they really want is the results – the success – you describe. Why wouldn’t they? So hopefully this article has described the process of how thinking about just one person will help you develop a set of key messages that will engage a target audience and generate the leads you want to grow your business. If you have any questions or would like some assistance, give us a call on 020 8634 5911. Talk to you soon. Are you trying to sell to Everyone? https://smeneeds.co.uk/wp-content/uploads/2017/01/SMEneeds-Logo.gif 0 0 nigel davey https://smeneeds.co.uk/wp-content/uploads/2017/01/SMEneeds-Logo.gif nigel davey2018-07-10 06:11:192018-07-05 08:29:17Are you trying to sell to Everyone? https://smeneeds.co.uk/wp-content/uploads/2017/01/SMEneeds-Logo.gif 0 0 nigel davey https://smeneeds.co.uk/wp-content/uploads/2017/01/SMEneeds-Logo.gif nigel davey2018-05-01 07:32:322018-05-08 14:38:01Who are you talking to? They are acquired by a company with a Marketing Dept. Email marketing is a great tool when used correctly. It’s cheap, completely trackable, and it can be personalised so that the content only goes to the right people. It is also causing a lot of heartache as people get their head around GDPR and what they can and cannot do via email. Let’s ignore for a moment that email is covered by PECR (Privacy and Electronic Communications Regulations) rather than GDPR. The biggest issue for email is consent. This blog is about the issues that multiple mailing lists can cause with consent. Social media: love it or hate it, it has become part of our lives, both professionally and socially. Even if you aren’t using it, I bet your friends and acquaintances are and they are bugging you to use it as well. For this article, let’s put aside personal use and look at whether you should stop using social media professionally. Your followers and connections are a fickle lot. They will love much of what you post and then Share/Comment/Like/Retweet, right up until the point they forget about you. Why will they forget? If you aren’t appearing on a regular basis. We all have so many messages chucked at us on a daily basis, including lots more connections and followers on social media, it is easy to forget someone and lose track of what is happening. Social media is called social media for a reason. If you want it to work for your business, you need to be sociable. If all you are interested in doing is posting your latest special offer, you are going to be wasting your time. If this is you, you really should stop using social media. If all you do is criticise others, particularly without offering a solution, you’ll quickly get a reputation. Check out some of our MPs to see what I mean. Nobody likes to be criticised, especially if you are just being negative and not suggesting an improvement. Not being there at all is even worse than being inconsistent. This is particularly relevant when you consider the activity of prospective clients or staff. Almost without fail, the first thing someone does when they hear about you is check your online presence. They find your website and then follow that with your social media presence. If your Twitter/LinkedIn/Facebook accounts haven’t done anything for 6 months, what are they going to think? You’re better off shutting down your account than having one that hasn’t been used for some time. Your social media activity is, presumably, being done to generate new clients. If not, I am wondering why you are spending valuable time on there. The question is: how much website traffic are you getting from your social media activity? If you don’t know, I refer you to our previous blog about Google Analytics and then recommend you see how much traffic you are getting. Any of these are bad and you need to identify which one is causing the issues and fix it fast. If you disagree, I have a challenge for you: nip down to your local bank and try and pay your mortgage with Likes! Are you using the social media platforms you do because you use them in your personal life and so know what to do (?!?!) or is there another reason? If you sell to Managing Directors of technology businesses, they are highly unlikely to be on Facebook (at least in a business mood) so activity on there would be a waste of time. Moving to LinkedIn (18,366 in the UK alone, plus another 8,648 CEOs) would be a far better option. Do any of the above resonate with you? If they do, you need to carefully consider whether you should stop using social media for your business. After all, your time is precious and you need to maximise your use of that time to generate leads for your business in order to grow. Want some assistance in working out what the Right Marketing Channels are for your business?